Proteome dynamics in rat gastrocnemius muscle. (A) Heatmap of FSRs (% day–1) of 75 proteins in rat muscle measured in n = 3 rats per group after denervation and clenbuterol treatment, with each horizontal line representing z-scaled FSR of an individual protein. (B) Effect of denervation surgery and clenbuterol treatment on FSR of CK-M, mean ± SD, n = 3–4/group. *P < 0.05 ‘Den-Veh’ vs. ‘Con-Veh’, #P < 0.05 ‘Con-Clen’ vs. ‘Con/Veh’, †P < 0.05 ‘Den-Clen’ vs. ‘Den-Veh’, 2-way ANOVA. (C) Effect of denervation surgery and clenbuterol treatment on FSR of CA-3, mean ± SD, n = 3–4/group. *P < 0.05 ‘Den-Veh’ vs. ‘Con-Veh’, #P < 0.05 ‘Con-Clen’ vs. ‘Con-Veh’, 2-way ANOVA. 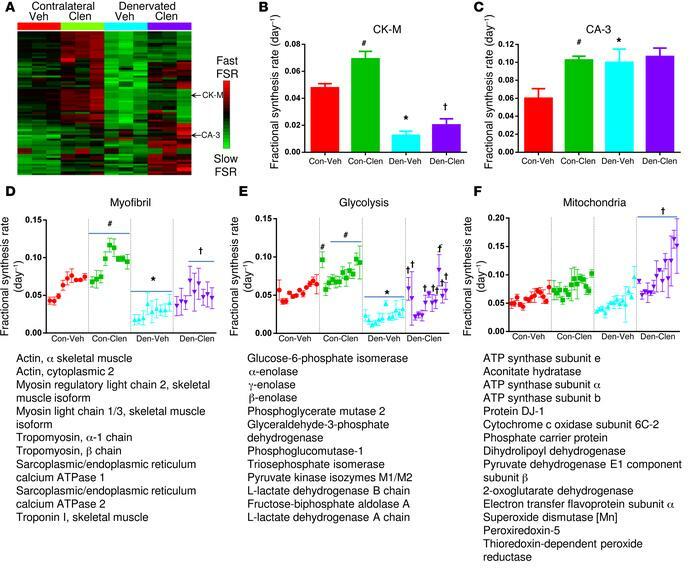 (D–F) Effect of denervation surgery and clenbuterol treatment on the FSRs of myofibril, glycolytic, and mitochondrial proteins. Names are listed in the order they appear on the scatter plots for each class of proteins. Data represent mean ± SD, n = 3–4/group, * corrected P < 0.05 ‘Den-Veh’ vs. ‘Con-Veh’, # corrected P < 0.05 ‘Con-Clen’ vs. ‘Con/Veh’, † corrected P < 0.05 ‘Den-Clen’ vs ‘Den-Veh’, 2-way ANOVA with Holm-Sidak correction. Con, control; Veh, vehicle; Clen, clenbuterol; Den, denervation.